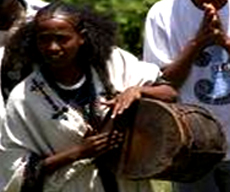 The Hammar are a tribal people in the Southern Nations, Nationalities, and Peoples Region of Ethiopia . They live in Hamer Bena woreda (or district), a fertile part of the Omo River valley. They are largely pastoralists, so their culture places a high value on cattle. Cow jumping, this rite of passage for men coming of age must be done before a man is permitted to marry. The man-to-be must "jump the cattle" four times to be successful and only castrated male cattle and cows may be used to jump over. This test is performed while naked (except for a few cords bound across the chest) as a symbol of the childhood he is about to leave behind him. On completion of this test, the young man joins the ranks of the maza - other men who have recently passed the same test and who spend the next few months of their lives supervising these events in villages throughout the Hamar territory. Unlike the Minoan bull-leaping, the cattle are held still by the maza, so the physical risk is limited. Women commonly end up as the heads of families because they marry men who are much older than themselves while they are young. When her husband dies, she is left in control of the family's affairs and livestock. She is also in control of his younger brother's and their livestock if their parents are dead. Widows may not re-marry. One Hamar woman who had long since left the village and begun life in a larger town spoke out against the (whipping) practice as unfit for an educated person. The ceremonies end with several days of feasting, including the typical jumping dances, accompanied by as much sorghum beer as the cow-jumper's family can provide to the visitors. Mursi is the name of a closely related sedentary pastoral Nubian people whose language is over 80% cognate with Suri. They are located next to the Suri in the center of the Omo Region and the lowlands southwest of Jinka in Ethiopia. The Mursi do not regard themselves as Surma, despite the cultural and linguistic similarities. 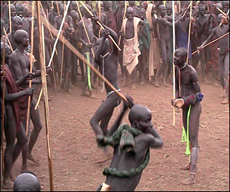 They have a macho culture, with an obsession for stick fighting called donga bringing great prestige to men - it is especially important when seeking a bride - and they are very competitive, at the risk of serious injury and occasional death. The males are often shaved bald, and frequently wear little or no clothes, even during stick fights. At a young age, to beautify themselves for marriage, most women have their bottom teeth removed and their bottom lips pierced, then stretched , so as to allow insertion of a clay lip plate. Some women have stretched their lips so as to allow plates up to five inches in diameter. With exposure to other cultures, however, a growing number of girls now refrain from this practice. 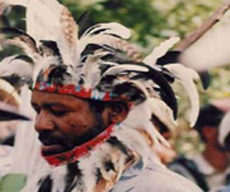 The tribe's children are sometimes painted with white clay paint, which may be dotted on the face or body. Village life is largely communal, sharing the produce of the cattle (milk and blood, as do the Maasai ). Though their chief (styled komaro ) wears the fur crown of a pagan priest-king, he is merely the most respected elder and can be removed. Few are familiar with Amharic, the official language of Ethiopia, and their literacy level is very low. 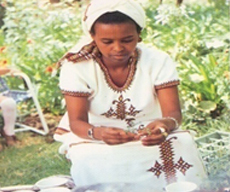 The Amhara women wear dresses that are tight-bodied and full skirted. The dresses are bright white with colored embroidery and woven borders. Although originally most of the border designs were based on the varied design of the Ethiopian cross, These days you can see an array of fine-looking designs. 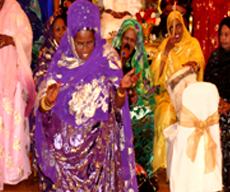 The Muslims of Harar wear colorful dress. The men often dress in red, purple or black. The women of Harar part their hair in the middle and make large buns behind their ears. Harari women have been known for their basketwork for centuries and still weave intricate creations from coloured fibers and grasses. Harar is also famous for the work of its silversmiths. 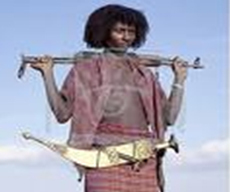 The Afar, most of whom occupy one of the most unfriendly desert or semi-desert areas in the world, have long been regarded as a fierce and warlike people. They are certainly proud and individualistic, and somehow manage to eke a living out of the challenging wilderness in which many of them live. The majority of the Afar are semi-nomadic pastoralists, but a minority have settled, notably those in the Aussa oasis. Almost all are Muslims, and are organized into confederacies of tribes, and clans. The nomads live in small, isolated groups with the camel as their beast of burden, and keep sheep, goats, and cattle. 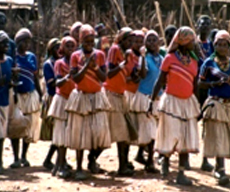 The lowland Somali wear long, often brightly coloured cotton wraps, while some of the cattle-herders in the lake district have clothing made of skins. The cornerstone of Konso culture, is highly specialized and successful agricultural economy that, through terracing buttressed with stone, enable them to extract a productive living from the none-too-fertile hills and valleys that surround them. 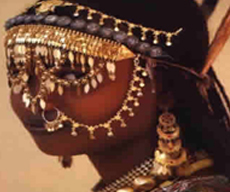 The women of Tigray wear dozens of plaits (shuruba) tightly braided to the head and fuzzing out at the shoulders. Young children often hav e their heads shaved, except for a tuft or a small tail of plaits, which are left so that if God calls them 'He will have a handle by which to lift them up to Heaven'.